Bella Terra, a residential community of apartment homes in Huntington Beach, needed a distinctive name and trademark. "Life at the Center of it All” became the call to action that sold downtown apartment life in a place known for sprawling suburban homes. The property promised a car free existence in the heart of Orange County, selling life on top of a shopping mall. 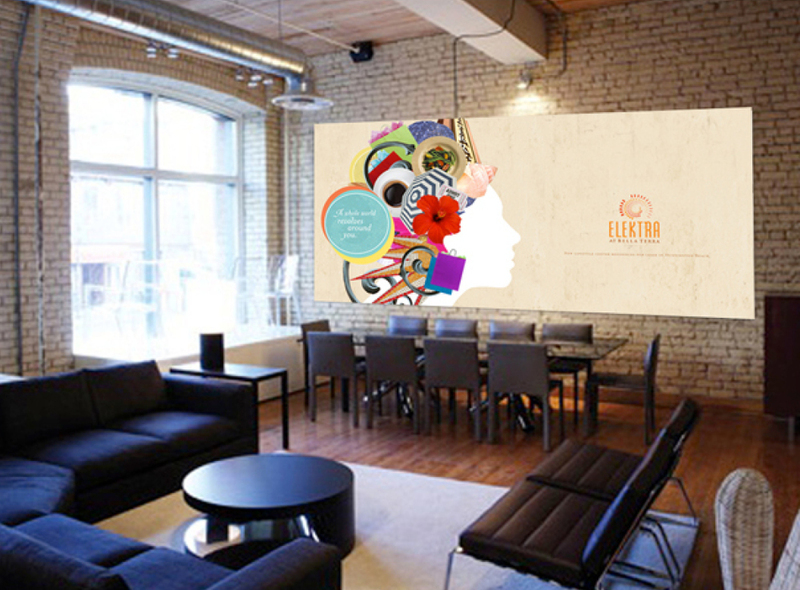 Rather than using models and architecture in a typical sales brochure format, the promotional materials showcased collage artwork. The artistic approach was a big departure for the Ad agency that typically created images through involved photoshoots. The design appealed to the young renters, selling pop art and fun activities rather than glamour and square footage. The scope involved positioning, copy writing, naming, logo design, and promotional materials. The proposed name, "Elektra" evokes the spirit of apartment home living. Radiating energy from its core, Elektra represents energy, community and the home as the center of life.